Trying to get back into a blogging rhythm here. I love writing this blog, I feel like it’s a personal letter from me to each one of you who takes the time to read it. Thank you so much for being there! Today I’d like to introduce you to a new indie to me and maybe to a lot of you also. Finger Bang Polish; a five free brand, started their business on February of this year after the owners (friends of course) went through an experience VERY familiar to many nail lovers. The dreaded lack of selection at local nail salons; I don’t even know if I could ever go back to a salon and pick from a collection of dated and sad looking little polishes. So, there they were really hating everything they saw and joked about actually making their own and call it Finger BANG! (as in the surprise when you see something awesome) after the initial laughter settled they really contemplated the idea and decided to go with it. I love this indie polish world because it’s made up of so many dreamers and doers, ppl who are putting their all into their product. I <3 that! 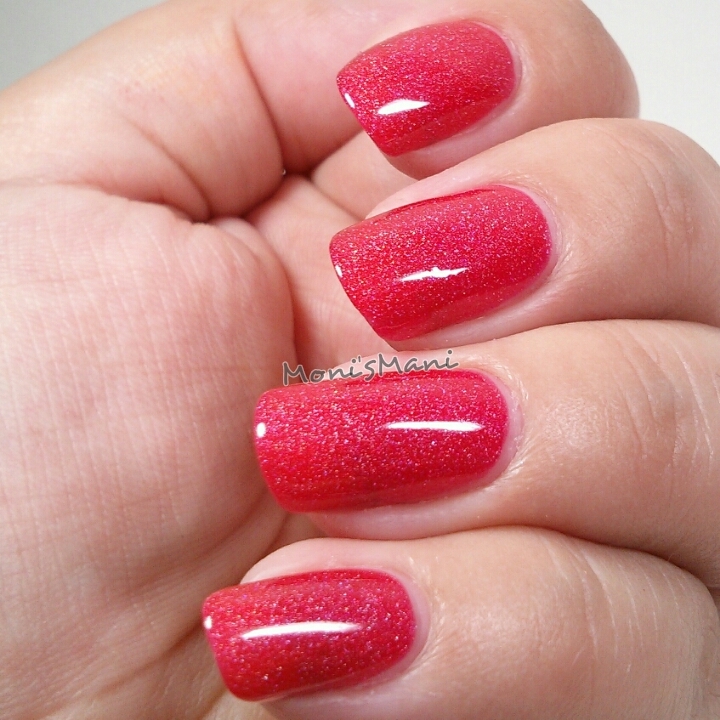 *Starburst- this is a beautiful strawberry holo jelly, of course this is the polish I went for first! this is totally up my alley. 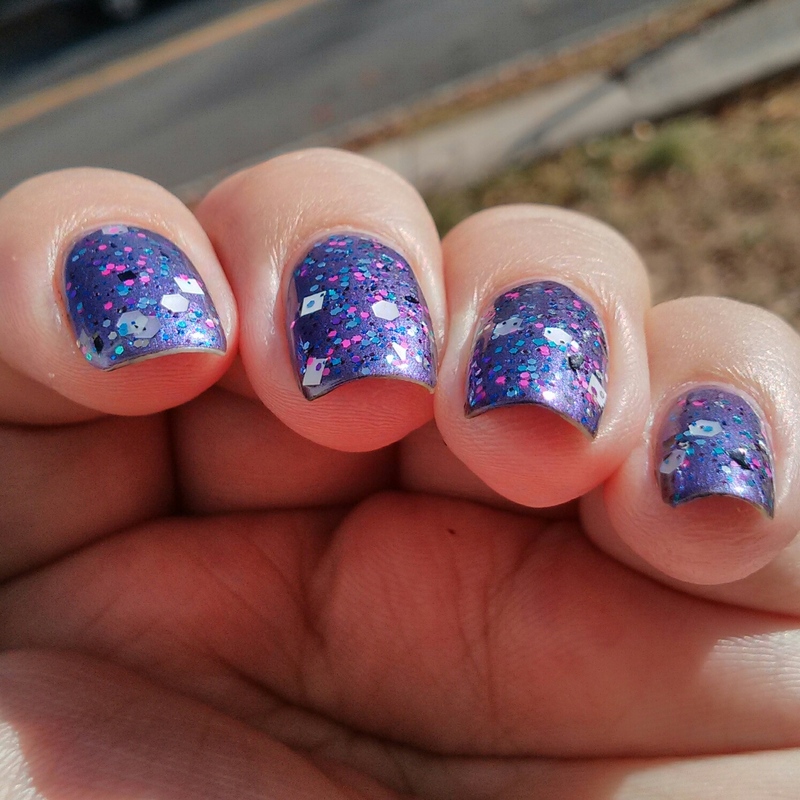 The formula was very very nice and flowy, you see three coats with no top coat in the pics, isn’t it so pretty and squishy? *Trippy- this baby is beautiful! my pics sincerely don’t do it justice but unfortunately we haven’t had a day of sunlight in NJ for weeks so I wasn’t able to actually “catch” it in pictures. This is a burple that is more in the purple side face to face but pulls bluer in pics. It is VERY pretty. *Party in my hands- wow!!! I looooveee this glitter!! had it on my 10 fingers for six days, felt like a rock star, isn’t this a good night out or NYE mani?. It’s made up of square white, silver hex, black flakes and purple, silver, blue, black glitters. the combination is beautiful! two coats on my nails, one coat of seche, no glitter food needed for a smooth surface. The absolute best part about my experience with this brand is that this is what my nails looked like on day 5. Look at that minimal tip wear after days of dishwashing, house cleaning and everyday life. isn’t that amazing? Thank you so much for reading! I hope you liked the swatches! and definitely give this brand a try! 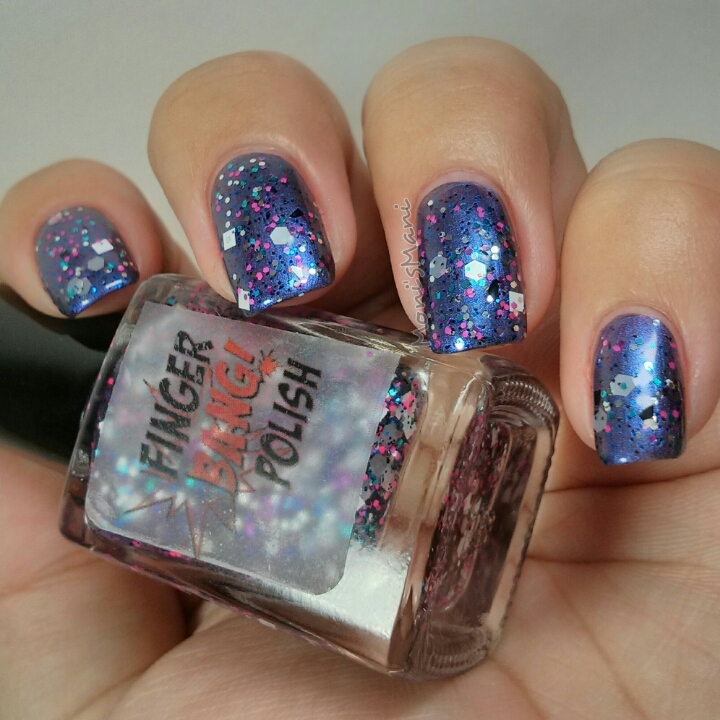 Thank you Finger Bang Polish for allowing me to review your product! you got a great thing going please keep it up!